Note that the main difference between these sounds is that one is voiced and the other is voiceless. Other than this they are produced in the same way with the mouth and tongue in the same position. First you need to explain to the class the mechanics of making these sounds. This means sticking your tongue out between your teeth. Demonstrate this carefully and in an exaggerated manner. In some cultures this is considered impolite but you will need to explain to the class that in order to speak English properly there is no getting around this and of course once they are able to produce the sound well the tongue doesn’t need to come all the way out of the mouth! 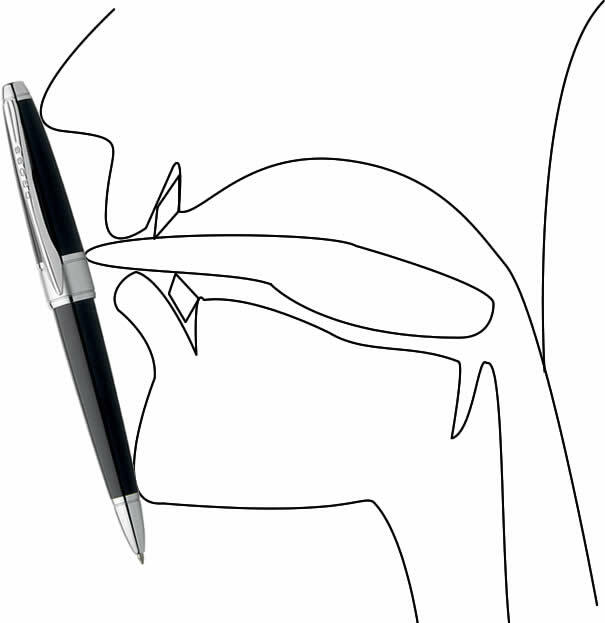 One way to help students with this is to get them to put a pen from their nose to their chin (see the diagram above) and then have them push out their tongue till it touches the pen. The next step is to show how to produce two versions of the sound: voiced and voiceless. Have the students hold their hand lightly on their throats and they will be able to feel the difference between /θ/ and /ð/ as they produce them. Finally, when the students have worked on the mechanics of the sounds it’s time to practice some more. But this lack of minimal pairs is not necessarily a bad thing. It means that students will have extra information available to identify the words and, practically speaking, if they use /θ/ instead of /ð/ or vice versa when they’re speaking it won’t make a major difference in terms of understanding. This is the third myth that they have thought of together. There’s a path to the bath where filthy father bathes in warmth. On the fourth Thursday of this month I thought I’d wear new clothes. I think my brother visited the theater this Thursday. Three thousand smooth teeth together in this healthy mouth. In this weather, wealthy people breathe through their mouths.